I love spinach pie. 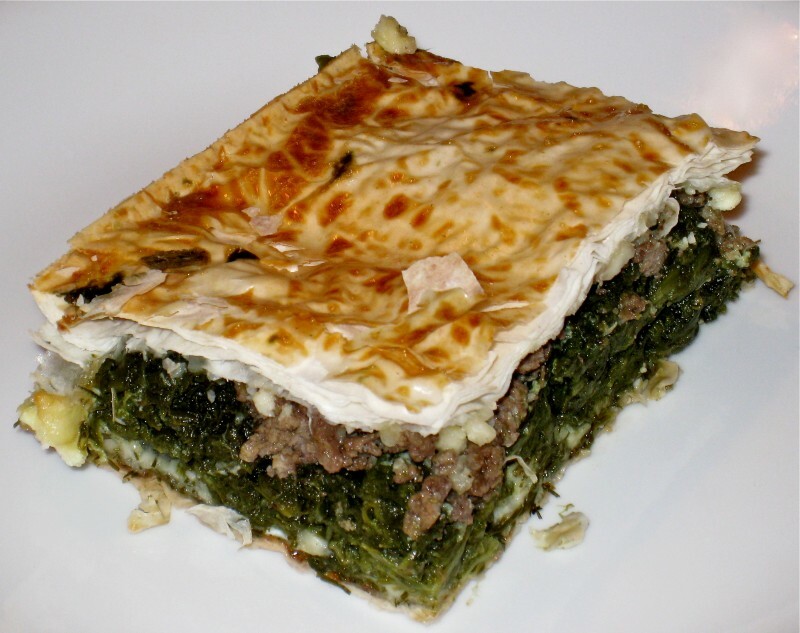 Let me say that again, so it sinks in: I love spinach pie. Spinach pie has been a staple at our shindigs for so long that we needed to take a break — hence the recent fascination with kale! Now that our poor pie recipe has been in hibernation for several months I think thats its ready to come out of retirement. Maybe it ran out of money like The Who and needs to make a surprise appearance! Makes a large baking tray, which is a lot of pie! 1 box of phyllo or puff pastry dough. I prefer the phyllo, but the puff pastry makes for a nice change once in a while. 1 lb ground lamb or beef (optional), seasoned with oregano and salt. If you decided to use meat (which you should), then season it with a lot of oregano and brown in a large skillet. Drain fat and cool while preparing the rest. Layer in ½ of the dough onto the bottom of the pan, every few layers give a tiny spritz of olive oil spray. 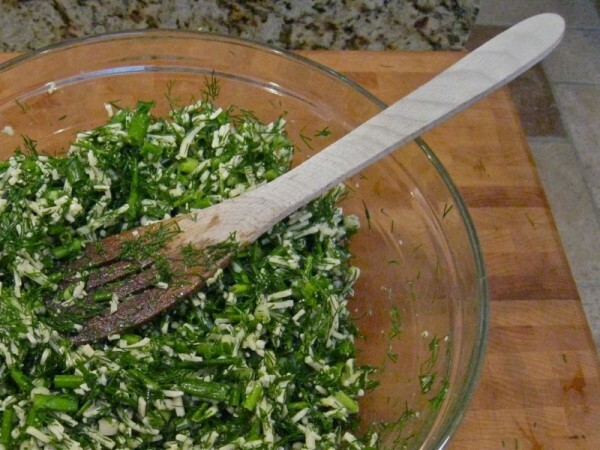 Spread the dill and cheese mixture evenly over the dough. Drain spinach well and spread evenly over rest of the pie. Spread the cooled meat evenly over spinach. Let the pie cool a bit and cut into squares. You really were on a roll, Andy! My gosh. I love spinach pie, too. I don’t make it enough – and it is not hard to make. We both love it. In Vanja’s culture, it is called Spinach Pita… but, is the same thing. It can be made in a big pan like you have, or in triangles, or rolled, etc. All of the women (most) still make that beautiful strudel dough by hand and that is what they use for these pies. Fantastic. I got a lesson on how to make burek last summer and can’t find a fine enough flour here. I did it myself there. Made the dough as big as a tablecloth and thin enough to read through. Could have never done it without such a great coach. But, this pie is so satisfying. I love it with dill and garlic. I have never used mozzarella. I use cottage cheese… but, what wouldn’t be good with mozzarella? You have made this with kale? Is it tough? Don’t laugh. It is an honest question. I will have to try your recipe sometime. I am so used to just winging it – that a new recipe would be a welcome change. Wow you rolled the dough by hand, that must have been some experience. I have a hard enough time making pizza dough! Hey Suzy. I usually use canned Del Monte brand spinach, but I am sure any spinach will do, and fresh is probably even better if you saute it. I squeeze the spinach out in a colander or a strainer to get it dry, but you don’t need to go too nuts. As far as beef or lamb, I am a lamb guy at heart (after all, it’s what beef wants to be when it grows up) so you know where I stand. Either way, once you saute it with a little oregano, you are set. Drain the fat and sprinkle it in the pie. A little goes a long way with the meat, so no need to go nuts. I usually make the pie half-n-half so non-carnivores can enjoy it as well. You’d be surprised at how forgiving this recipe is. The fresh dill and a little nutmeg do make. Now look what you’ve done, I done drooled on my keyboard….lemme know how it comes out!